It was such a gorgeous day. I remember driving to the office and saying out loud to myself "what a beautiful day!" I don't remember ever doing that before, or since. I was out of my office, but in the building, when I was told that a plane hit the World Trade Center. 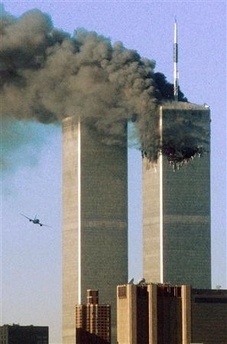 I was thinking how could a pilot hit the World Trade Center in such perfect weather. I thought of the Army B-25 bomber that crashed into the Empire State Building in 1945. When I got back to my office I was told that both towers had been hit by planes. I still didn't get it. 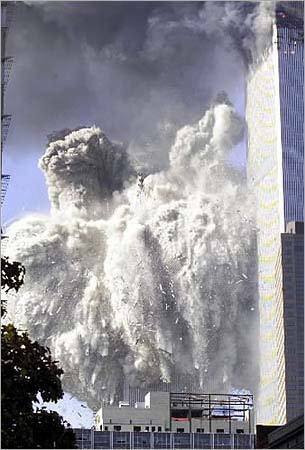 I was still thinking small private planes - then I saw a replay of the second plane, a 757, crashing into the South Tower of the World Trade Center. That's when I realized the world was different. We were short staffed, two attorneys were attending a conference in New Orleans, and I still had a lot work I wanted to get done, but I kept going back to the television. We watched the burning smoking towers. The brother of one of our attorneys was working in the south tower, she was worried. I kept trying to reassure her, telling her how tough the towers were. I spoke with my wife. I tried to reassure her and she had been doing the same with worried friends. We heard that the Pentagon was attacked. Then we heard reports [just bad information] that there was an explosion at the State Department. The news coverage was confused. Hell, no one knew what was going on. Then the towers fell. I just couldn't believe it. We didn't understand how many firefighters were lost in the towers, but the firefighters did. One of my most vivid memories of 9/11 is of fire fighters withdrawing to the West Side Highway after the towers fell. The TV broadcast I was watching showed one of those firefighters take his helmet and throw, no slam, it to the ground many feet away. That act captured all the anger, frustration and fatigue both physical and emotional. I remember more, I remember the President reassuring the nation, more than once. I remember watching Palestinians dancing in the street. There is more. I remember my co-worker's relief when she learned, hours after the towers fell, that her brother got out of the tower and was safe. I remember the people streaming out of New York. I remember the hospitals staffing up to treat the thousands and thousands of injured we all anticipated would be pulled from the ruble. I remember the burning rubble. I remember more. I especially remember how happy and relieved I was to get home and to just be with my wife and children. These are the things I think of first whenever I think of 9/11. I wish I was able to convey the emotions the memories conjure up in me, but I'm sure you know how it felt. Alan Jackson captured all those feelings in his "Where Were You (When The World Stopped Turning):"
I just returned from a vigil at University Yard, remembering the victims of September 11. Services like these always hit home; especially for events remembered firsthand. We each received a candle upon arriving at the yard, surrounded by a plastic cup to keep the wax from our hands. At the conclusion of the service, after speakers and prayers, messages and memories, we lit the candles and stood in silence. Gradually, people drifted off; it was, after all, a Saturday night. I waited, with my roommate, a friend from PE Wild, and her friend from American. We remained until 9:12, allowing for a minute of silence at 9:11 as I remembered doing back home. While waiting, I let my mind wander inside itself a bit, doing its usual pondering about life, the universe, and everything; about existence and reason, emotion and liberty, life and freedom. I'd like to share those thoughts that stuck out. A breeze started about the time of the candle lightings. It wasn't particularly strong, but it was chilly enough to force notice. It also required paying attention to the candle, lest the wind extinguish it. As I'm sometimes wont to do, I made a little metaphor. The candle reminded me of the often-used phrase, almost cliché now: the Flame of Hope, of Freedom, of Life itself. It required an effort on my part to maintain the flame's strength. I found that, after letting my mind wander for a minute early on, the wind extinguished the flame, and I required someone else's candle to ignite it again. Such is often the case with Hope. When faced with an unusual situation, one that discourages and scares us, humans cling to this concept of "Hope," a belief that the storm will pass. Sometimes, when the storm continues to batter us, that hope begins to wane, even dying completely. In those situations, we require the presence and support of others. Through their strength, we can rekindle our own Hope, reignite its flame. A second time, I caught myself gazing at the sky. The clouds which had eclipsed the stars during the vigil now began to move elsewhere, and the lights of the heavens began to shine through. When I glanced down at my candle, however, I found the flame almost dead. Cupping my hand around it, I shielded it from the chill and strength of the wind, allowing it to remain. It reminded me of our Freedom, such a fragile concept. When our grip on the concept slackens, when we let the idea slip to the background, it can disappear far too quickly. Each of us has to realize the concept, to live it every day, lest that Flame die as well. Freedom is a much harder flame to reignite once it dies. Before those in attendance lit their candles, the names of nine GWU alumni killed on 9/11 were read aloud. At each name, Omar, the president of the Student Association lit a candle, placing it on a table in front of him. The wind picked up as he tried to light the first candle, and I actually felt my pulse pound as I prayed the light would not go out. Each candle here symbolized a life, and Omar refused to let the lights of those lives burn out. He made sure each candle caught before replacing it, and not once was the wind able to extinguish a flame. Though the lives those candles symbolized had already ended, their memories carried on through the flames. Not even the cold acts of terror, which ended their mortal existence, could erase the marks they as people left upon the Earth and their fellow humans. We all require assistance at times. Hope can falter, but others can right it. Lives may end, but others will remember the deeds done. Freedom may fall under attack, but those who live it and believe in it can save it. Cherish your freedom, the life you live, and the hope you carry, for yourself and all those who follow. May all Humanity one day relish in the joys of freedom, from fear, from oppression, from terror. Live your life, and realize you don't have to do so alone.